I’m lucky enough to live in a house that has a south-facing garden. That means that at this time of year the low angle of the sun compared to the summer brings fresh photographic perspectives. An early season frost that’s lit by the sun soon melts into a myriad of little backlit water droplets. 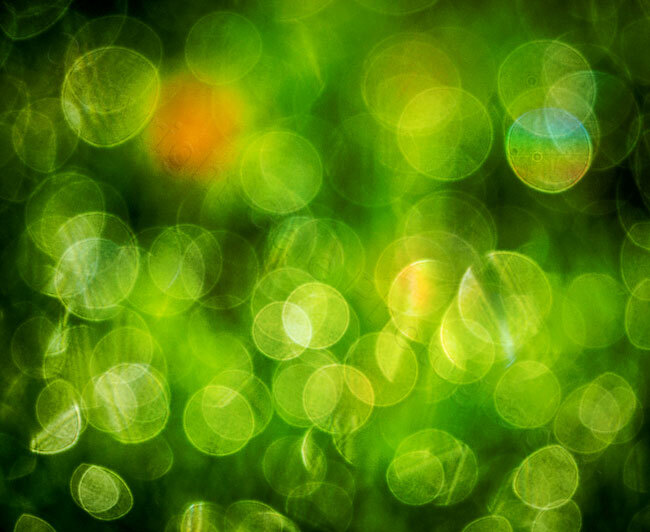 A great time to break out the long focal length or wide-aperture lens and try for some bokeh circles. The first lens I used was my Panasonic 100-300mm. It’s the equivalent of a 600mm lens on full-frame. Having a 4/3rds sensor it’s harder to get good bokeh than with a full-frame camera, but with the right technique it’s pretty good. For this image, of water droplets on a weeping silver birch tree, I used the lens at its maximum focal length to get the most magnification, and of course, at its widest aperture to give round highlight circles. The lens was focused at infinity. The nature of the subject changes the overall feel of the image. This is melted frost on a buddleia shrub, which explains the strong green colour. There are just a few orange shapes to give a bit of colour contrast. It’s like a crowd of Venn diagrams! I swapped lenses for this final shot. I used my Sigma 30mm f1.4 lens and got a backlit single water droplet on a branch very close to the front of the lens. The background was a hedge in shadow. 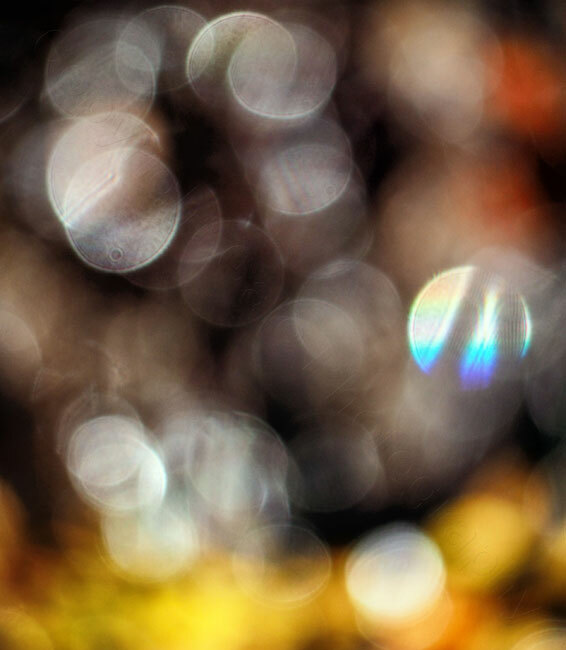 The aperture was set to f1.4 and the bokeh circle is therefore very big. There’s all manner of stuff going on in the highlight. 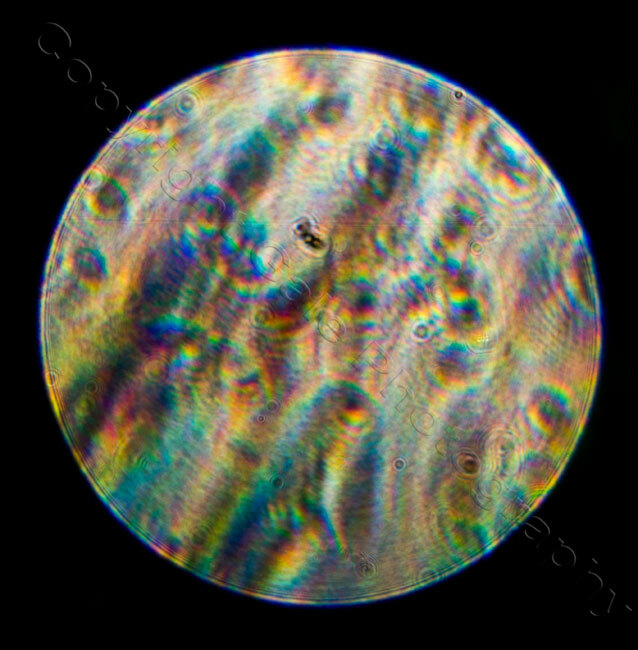 It’s like an astronomical image of a planet or moon rather than a drop of water. Low angled light in the garden on a frosty, sunny morning = time for some delicious bokeh.